Fortnite manages to hold on to its crown for another week. A 5.2 per cent increase in views has put another few million hours between the battle royale and the second game on the board. League of Legends has experienced a 7.3 per cent decrease in views, but remains hot on the heels of Fortnite. 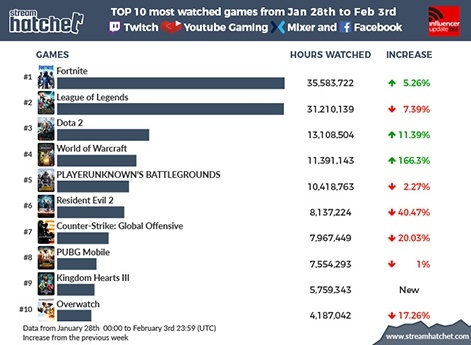 Dota 2 is in third after an 11.3 per cent increase in views last week. A fresh entry at four comes in the form of World of Warcraft. Blizzard's long-serving MMO has a 166 per cent increase in views last week, presumably due to the new raid, Battle for Dazar'Alor. PUBG takes fifth place for another week despite a 2.2 per cent decrease in views last week. Resident Evil 2 has fallen to sixth place after entering the chart at third last week. Capcom's remaster of a classic has dropped over 40 per cent in views. CS:GO dropped from sixth to seventh after a 20 per cent drop in views. PUBG Mobile takes eighth place after a small yet impactful 1 per cent drop in hours wathced. 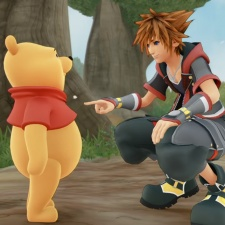 Kingdom Hearts 3 is a new entry in ninth place. The long-awaited conclusion to the Kingdom Hearts series racked up over 5/7 million hours watched across the board last week. A low entry for such an anticipated title but it has the potential to rise in the next week. Overwatch closes the chart again for another week; the shooter has managed to stay on the chart despite a 17.2 per cent decrease in views. Its resilience has also seen Sea of Thieves fall from the top 10.